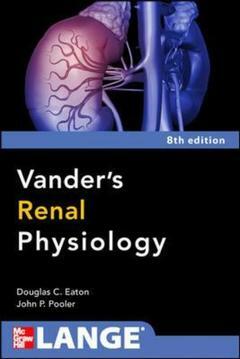 Vanders Renal Physiology EATON Douglas C.
Auteur : EATON Douglas C.
Written in a clear, concise, logical style, this trusted text reviews the fundamental principles of the structure, function and pathologies of the human kidney that are essential for an understanding of clinical medicine. Combining the latest research with a fully integrated teaching approach, the eighth edition of Vander's Renal Physiology features revised sections that explain how the kidneys affect other body systems and how they in turn are affected by these systems. Each chapter is filled with the tools you need to truly learn key concepts rather than merely memorize facts. Begins with the basics and works up to advanced principles. Focuses on the logic of renal processes Includes the most current research on the molecular and genetic principles underlying renal physiology. Explains the relationship between blood pressure and renal function Presents the normal functions of the kidney with clinical correlations to disease states. Includes study questions with an answer key at the end of each chapter. Features learning aids such as flow charts, diagrams, key concept clinical examples, boxed statements to emphasize major points, learning objectives, and review questions with answers and explanations.